This event is now fully booked. A small number of additional tickets are available for teachers (including school IT staff and teaching assistants), those intending to bring and demonstrate a project, and adult Python programmers willing to help out with the tutorials. Please email admin@cotswoldjam.org to claim those tickets. • Reaction Tester tutorial – Make your own reaction timer using an LED light and a button. Can you press the button fast enough? This tutorial will use the new GPIO Zero library, Python 3 and Raspbian Jessie to make programming electronics much, much easier! Attendees will be able to take away the electronics kit for free (limited to 12 kits). Suitable for ages 8 to adult, starts 1:30pm. 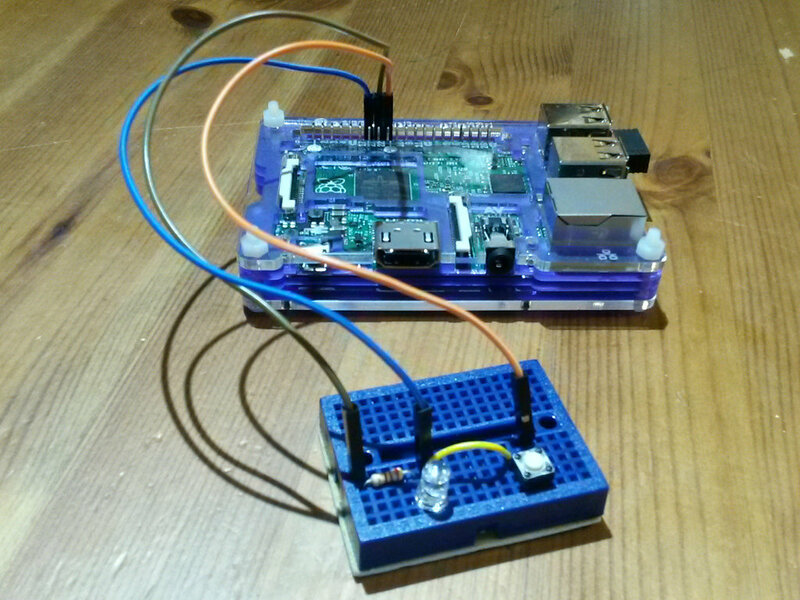 • Astro Pi – have a play with Raspberry Pi in SPACE! We’ll have several setups of the Raspberry Pi Sense HAT, the same equipment being used by British astronaut Tim Peake aboard the International Space Station right now. • Quadcopter demonstration – Using the new £4 Raspberry Pi Zero as the brain of an automated (self-controlling; not remote-control) drone. With a teddy bear for a passenger! • Minecraft programming tutorial – a super-quick tutorial on how you can reprogram Minecraft to do things you can’t normally do in the game. Suitable for ages 8 to adult, starts half an hour after the Reaction Tester tutorial finishes, probably 2:45pm. • Weather forecast demo – a demonstration of a simple home weather station, that takes outdoor thermometer readings, then combines them with Met Office data to display forecasts on an LCD display. • Coding competition – further to the Reaction Tester tutorial, how small can you make a Reaction Tester program in Python with GPIO Zero and Raspbian Jessie? • FPGA programming – how to make your own custom computer chips! • Plus all the fun of the Show & Tell room. Get inspired by other people’s projects, and bring along any projects you’d like to show off, even if they’re only half complete. You can get lots of advice and help with any projects you are planning. There will be dozens of spare Raspberry Pis for you to play with if you don’t already own one. Feel free to bring along your own Raspberry Pi to the tutorials. We have a number of spare pre-configured Micro SD cards (and full-size SD adapters) which we can loan out for the tutorials, so you don’t need to worry about setting up your Pi. We also have keyboards, mice, monitors and HDMI cables available. Please bring your own power supply if possible.